Magic is certainly in the air as Cinderella (Kaitlyn Davidson) departs for the Prince’s ball on an enchanted coach. Photo Credit: Carol Rosegg. Magical? Check. Musical? Check. Charming? Check. Yes, the tour of the Broadway production (nominated for nine oscars) of Rodgers and Hammerstein’s lovely “Cinderella,” with a new book by Douglas Carter Beane, is everything Cinderella should be! On opening night, there were many young princesses in attendance with their parents-in-waiting and an extraordinary number of gay male couples. Everybody, I think, fell quickly under the enchantment of this gorgeous fairy tale. The touring company, which has been on the road for just over two years, is giving its final performances here in San Francisco and the production is as fresh as a daisy. A fellow critic speculated that perhaps the company is feeling nostalgic and particularly enthusiastic as they enter their final week of performances, but, whatever the reason, the show is as new and magical as an enchanted pumpkin. Adults (and bright youngsters) can certainly enjoy Douglas Carter Beane’s new book, which adds such details as a Machiavellian prime minister who tricks the Prince into signing oppressive legislation, a nerdy revolutionary in love with Cinderella’s stepsister, and a plot requiring that Cinderella not just be beautiful but that she persuade the Prince to confront the evil Prime Minister and listen to his people’s pleas for justice. Beane’s jokes are telling, topical, truthful, and fun. There is a particularly funny sequence where the ladies at the Ball, led by the Evil Stepmother, indulge in a competitive, courtly game of “Ridicule” (what I would call “one-up-man-ship”) that involves trading insults under the guise of courtesy. Cinderella responds that all the best society is playing nice, nowadays, and proceeds to demonstrate what she means, establishing her superiority and one-upping her stepmother in one fell swoop. It’s funny, and does not lack subtlety. But let’s get to the magic: the costumes, designed by William Ivey Long (who won a Tony for his work), are spectacular, and Cinderella’s magical transformation from rags to glamour is a neat illusion that brought gasps and applause. Likewise for the flying fairy godmother, the magical pumpkin coach, and the transformation of rodents to footmen and horses. The set design and lighting designs by Anna Louizos and Kenneth Posner are a fairy tale come-to-life. And while complimenting the designers, Nevin Steinberg’s sound design deserves special mention: rarely has a show at The Orpheum sounded this good. And on to the music. While this is hardly Rodgers and Hammerstein’s best work, it is charming and contains several memorable songs including the popular “Impossible,” and “In My Own Little Corner.” Principals, chorus, and orchestra (well-conducted by Valerie Gebert) give it their all, with very satisfying results. The comedy turn, “Stepsister’s Lament” is a highlight. Kaitlyn Davidson is a smart, sophisticated Cinderella and Andy Huntington Jones is more than adequately princely and charming. The rest of the cast all tell the story with humor, enthusiasm, and a refreshing lack of any creeping adult cynicism. They get the laughs, but play the story straight-forwardly, as they should, with no inappropriate winking. Blair Ross, as Madame, Cinderella’s cruel stepmother, is particularly hilarious in her sendup of the bourgeoisie and Blake Hammond, a performer with multiple Broadway credits, is deliciously oily as Sebastian. Chauncey Packer brings impressive operatic chops to the role of Lord Pinkleton. This is a Cinderella that is sweet and satisfying, with no hint of saccharine and no bitter after taste. 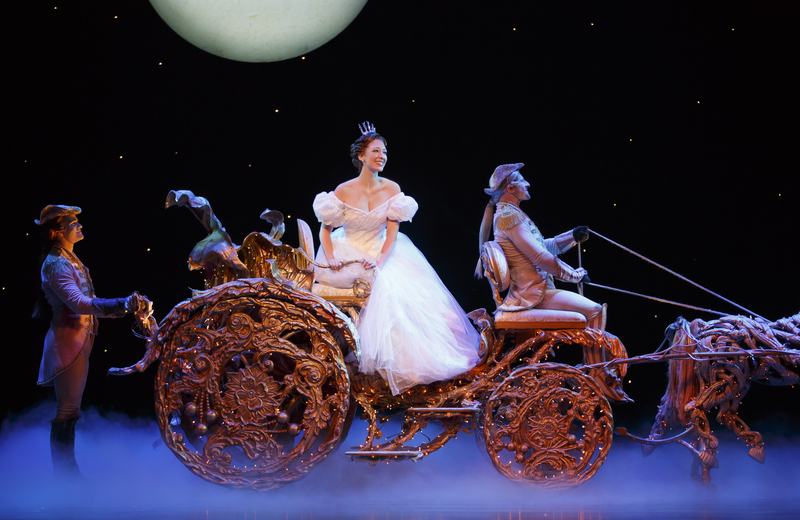 “Cinderella” continues at the Orpheum Theatre through May 8, 2016. For further information, click here. “Cinderella,” music & lyrics by Rodgers & Hammerstein II, new book by Douglas Carter Beane. Original book by Oscar Hammerstein, II. Director: Mark Brokaw. Choreographer: Josh Rhodes. Musical Adaptation, Supervision and Arrangements: David Chase. Orchestrations: Danny Troob. Scenic Design: Anna Louizos. Costume Design: William Ivey Long. Lighting Design: Kenneth Posner. Sound Design: Nevin Steinberg. Hair and Wig Design: Paul Huntley. Music Director and Conductor: Valerie Gebert. Ella: Kaitlyn Davison. Woodland Creature: Paige Williams. Topher: Andy Huntington Jones. Lord Pinkleton: Chauncey Packer. Sebastian: Blake Hammond. Marie: Lauren Sprague. Jean-Michel: David Andino. Madame: Blair Ross. Gabrielle: Kimberly Fauré. Charlott: Lulu Picart. Fox: Michael Callahan, Rachel Fairbanks. Raccoon: Chip Abbott, Lauren Lukacek. Footman: Michael Callahan. Driver: Chip Abbott. Lady of Riducle: Lauren Lukacek. Ensemble: Summer Broyhill, Michael Callahan, cody Davis, Rachel Fairbanks, Arianna Roasrio, Sean Seymour, Paige Williams, Thad Turner Wilson, JKohn Yi. Posted in Reviews.Tagged Charles Kruger, Cinderella, Kaitlyn Davidson, Orpheum Theatre, san francisco bay area theatre reviews, SHN, theatrestorm.